Welcome to our server! Here's what you'll need to get started. Note: we are unlikely to be able to assist you in making regions other than NA work properly. You may need to adjust the language settings of Ashita/Windower and/or pass --lang EU or --lang JP to the loader to get your client up and running. Microsoft Visual C++ 2017 Runtime Redistributable Package (x86) - as older Runtimes are phased out this will be replacing them more and more. Darkstar is already using it for their version of the loader. To start off, you'll need to download all of the links provided above. Keep FFXISETUP.EXE and the corresponding data files together in their own folder, separate from any other files. Begin preparation by installing the Microsoft packages. Depending on the operating system you're running, your system may already have them pre-packaged. This is fine, just move on to the next! All Microsoft packages must be installed in (x86) even if you have a 64 bit system and even if you have the 64 bit version of that package already. Note: some things will need to run as Administrator. This isn't the same as running from an admin account. If you are confused, Google it. Additionally, if the desktop dims from a UAC (User Account Control) prompt, FFXI will crash. You may want to just disable UAC (or adjust UAC settings so that it doesn't cause the desktop to dim for a UAC prompt) instead and solve both problems at once. Its up to you. If you're running Windows 8, 8.1, or 10, an additional step is also required. Right-click the START button on your task bar and select Programs and Features. On the side menu, choose Turn Windows features on or off. From this point, find Legacy Components in the list and enable Direct Play in the drop-down folder. Please remember that this step is ONLY required if you're running Windows 8, 8.1, or 10. When FFXISETUP.EXE and the corresponding data files are all together in their own separate folder, run FFXISETUP.EXE. This is a fairly large installation and you will need to be present during the installation to accept on multiple different windows that are required in order to complete installation. Follow the prompts for installing PlayOnline Viewer, Final Fantasy XI, and all of the expansion packs. Using the default file location is recommended. Once you enter the credentials, you'll be brought to the main page of PlayOnline. Now you'll want to close PlayOnline and locate the file UpdatePatch.Zip or download from the Files section located here if you haven't already. Right-click the file and choose to extract. It's recommended you extract these files into an isolated folder so that they don't get confused with any other files. Once these files are extracted, copy them into your Final Fantasy XI directory. The typical default location is "C:\Program Files (x86)\PlayOnline\SquareEnix\Final Fantasy XI\". You'll be prompted to overwrite these files, accept this! After letting the files from the update patch copy into your Final Fantasy XI directory, re-open PlayOnline. You'll find yourself once again on the main page of PlayOnline, on the lefthand side there should be a menu. Choose Check Files. You'll be greeted with another page with a drop-down menu. Select this and choose Final Fantasy XI. Once you've done that, go ahead and proceed with the update. PlayOnline will run a file check to search for corrupted, broken, or outdated files. This will take several moments, and following the scan, you'll be brought to a page telling you how many files need repaired. Accept the prompt to fix these files. This will begin a repair that will take several hours. At this point, you do not need to pay close attention to your update. You can step away from your computer while it's updating and check back when it's complete. Once it's complete, close PlayOnline. Check to see if your system meets the system requirements to run Ashita. Download Ashita directly from the developer here http://ashitaxi.com/. If you have downloaded Ashita from any other site than directly from the developer please delete it and download it directly from the developer. Move this file to a folder named "Ashita" (the recommended directory is [C:\Ashita]. After moving the file to the location of your choice, right click the program and choose Run as an Administrator. On the initial launch, it will install all files necessary for Ashita to run properly. The exception here is the Microsoft packages and .NET Framework, if you ignored the Installation Preparation step, you will NEED to install these files to use Ashita. If you haven't already, please reference the Installation Preparation step for instructions on how to properly install these files. Once the download is finished, upon opening Ashita you will see 3 default configurations. Select Private Server and then click the pencil icon located at the bottom of the Ashita menu. Another menu will pop up. At the top, click on the large blue text that says Private Server. Rename this to HomepointXI FFXI. 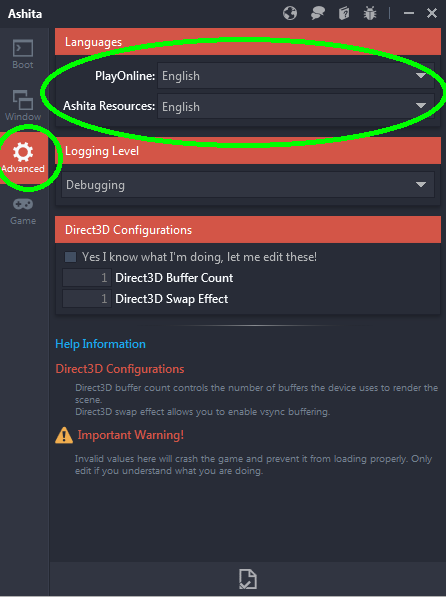 This is strictly for usage with DSP private servers, if you are using Ashita to connect to retail, the File needs to be left blank. For further instructions on how to configure Ashita, please view the Ashita documentation on the developer's Wiki here: https://wiki.ashitaxi.com/doku.php?id=ashitav3:installation. Congratulations, you're done with the installation! Now you can log into the server by selecting the arrow next to the "HomepointXI FFXI" configuration. Please be aware that Windower is not fully supported on HomepointXI or DSP, which means should you run into issues related to private servers specifically, you should ask DSP before going to Windower support. Also be aware that most of us at HomepointXI are ashita folks, we're unlikely to be able to help you on Windower issues. Contact DSP for help, those are mostly windower people. To get started, download Windower 4 by visting http://windower.net/. Drop the XiLoader.exe into your PlayOnline folder. After this, run Windower.exe in its own folder to trigger the update that downloads all the necessary files for Windower to function. Open settings.xml with some type of editor, such as Notepad ++. Additionally, you can also open Windower and create a second profile. You'll need to add the <executable>XiLoader.exe</executable> to every profile, as well as the <args> </args> with your server information and login. Note the path cannot contain spaces and cannot be a relative path unless in the same directory as windower (just using "xiloader.exe" works in that case). Also note windower devs occasionally break this during updates..
After that, you should be able to select your profile from the launcher and use Windower 4. If you find yourself struggling to understand this guide or you're having an issue, please read through the guide to make sure you haven't missed a step. Afterwards, if you continue to run into complications, please utilize the following options for help. To ask a question or receive help, you can post on our Play Q&A category on the forum located here. Please note that anybody registered to the forums can respond to your post and it may not necessarily be a GM that responds to you. Many of our players are very helpful and respond to posts asking for help. On Discord, there is almost always a staff member present to assist you, as well as knowledgeable players that are willing to help as well. Please connect to your Discord channel using the following link: https://discord.gg/PuNWGsB. Please note that our staff and players are all real people and can get busy. If you don't get a response right away by saying something in the main channel, please be patient. Lastly, if you have found an issue with the installation itself or something game-related, please fill out the form provided on our github. You can find this here for game-related issues, or here for website or wiki related issues. If you are reporting a wiki-related issue, please make sure to mention in your report that is pertains to the wiki. This concludes the guide, thanks for choosing HomepointXI and have a great day, we can't wait to see you in-game! This page was last edited on 20 April 2019, at 00:55.